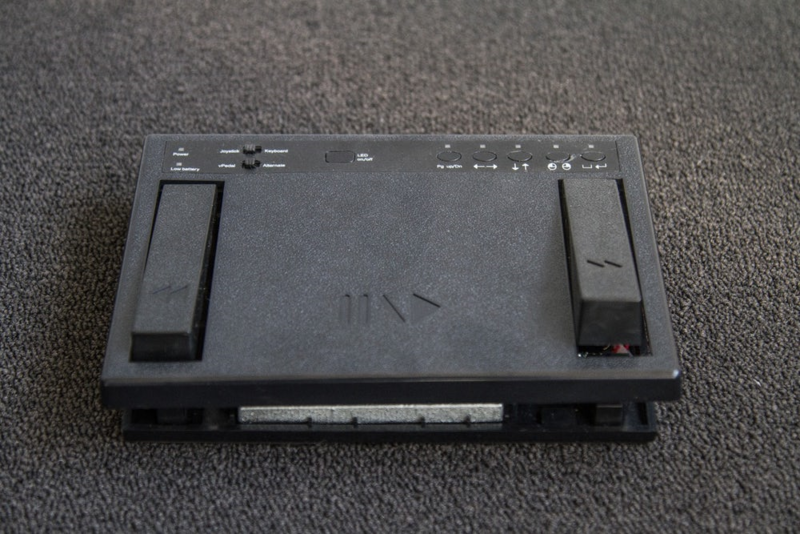 vPedal vP4 MkII: a Bluetooth foot pedal you can use to control the audio playback while your hands are flying around the keyboard (Credit: Noel McKeegan/Gizmag). Sometimes you need more than two hands to operate your computer – transcribing audio interviews is one such time, playing complex games can be another. 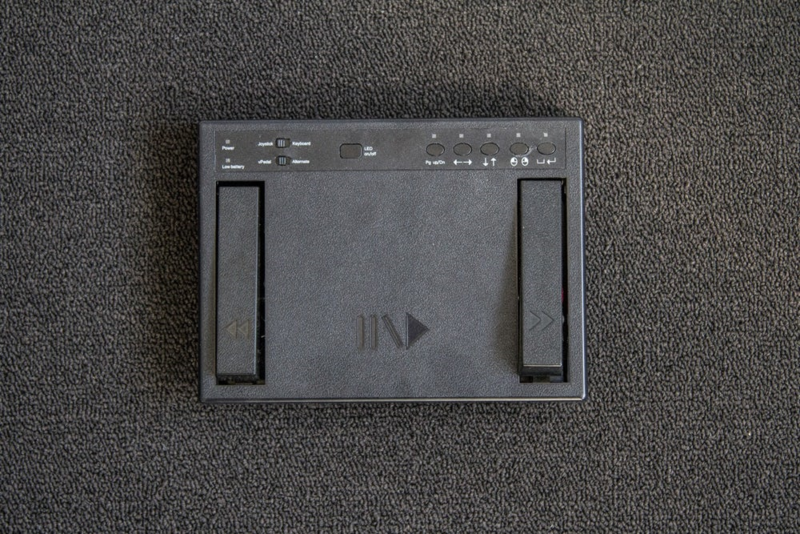 The new vPedal vP-4 is a programmable Bluetooth device that lets you use your foot to operate a range of audio controls or keystrokes, effectively giving you an extra hand. Transcribing audio recordings is a sucky, horrible job. Unfortunately, online transcription services are juuuuust expensive enough and enough of a delay to put them on the borderline of being worthwhile. Thus, we do our fair share of transcribing around the Gizmag office. Here’s the problem with transcription work: you’ve got to start and stop and rewind the audio recording constantly, and unless you have fancy-schmantzy transcription software installed, that means mousing out of your text window and into your audio player to start and stop it. There’s hotkeys on some keyboards, those can be useful – but if you’re typing at any speed, hitting function keys puts you out of rhythm and slows you down. Hence this – the vPedal vP-4 MKII. 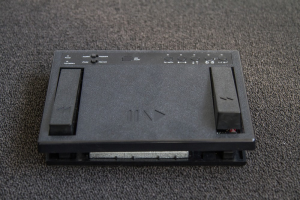 It’s a Bluetooth foot pedal you can use to control the audio playback while your hands are flying around the keyboard. Setup is simple enough on the Mac we tested it on – plug in the Bluetooth dongle to a USB slot, install the Vpedal Omnicontrol app, and open your audio file in Quicktime. Transcribing into a Textedit window, using the pedal is equally simple; hold the main part down and the audio will play, lift your foot off and it stops, and there’s side buttons for rewind and fast forward. I’ve got big boofing feet, so I found it best to flip my shoes off and sock it. The app is programmable, and there’s other apps you can install, to give the Vpedal the ability to transmit different signals. Gamers can bind any key to any of the three pedals, likewise it could be a handy tool for video editing as well; an extra hand when you need one. It’s easy to set up, through the Omnicontrol app you select which app you want to program it for, then tell it which foot control means what keyboard command. Construction-wise the 900 g (2 lb) Vpedal is solid enough, but certain elements could probably be better – especially for something that’s designed to be stomped on all day. Our fast forward pedal popped loose, and the electronics are naked and ready to collect dust under the top board. To make it worthwhile, you’d need to have a lot of transcription in front of you. And if that’s the case, you have my deepest sympathies. I am pedalling to work these days – not, I hasten to add, on a bicycle, but on a vPedal, designed in Melbourne and marketed all over the world to people transcribing audio recordings. Transcribing from analog tape is laborious enough, but trying to use a mouse to control playback of a digital recording on the screen is a terrible chore. Enter vPedal, a foot-operated device that starts and stops the recording as you type, and helpfully backs up a couple of seconds each time you pause, thereby repeating the last few words you typed as a “lead-in” to the next phrase, making transcription much more efficient. Mr Kelly developed vPedal when he was the IT guru at the Department of Justice in Melbourne, where court reporters have to transcribe audio recordings of cases. But his market has expanded to include surgeons and pathologists (some of Mr Kelly’s best international customers are the big medical transcription services in the US and Europe), police, movie subtitle writers and animators who synchronise words to mouth movements. Gary Fielke, of TriX Software in Adelaide, developed the vPedal’s excellent Mac OS X software, which allows control of playback speed and pause-back time. Windows a version are also available. 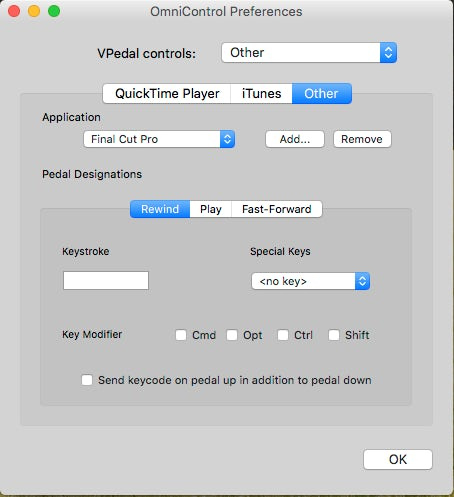 The vPedal for the Mac is a USB device and can be used with audio files in QuickTime, Real One, iTunes AAC, and Windows Media Player and many specialist formats. Transcribing interviews is one of the more tedious chores in the Upgrade Research Lab, as anyone forced to relive meetings, lectures or interviews while typing them up can appreciate. As is often the case, finding the right tool for the job makes the world of difference. In this case, it’s vPedal, a small foot pedal that attaches to your computer via a USB. It allows you to play, pause, rewind and fast-forward digital audio files without lifting your fingers from the keyboard. Despite its low price tag, the vPedal feels strong and sturdy, with good action in the springs. It works with Windows 7 and above, or Mac OSX, and is very simple to configure. The central pedal is play/pause, while the left and right pedals are rewind and fast-forward respectively. The catch here is that you need to record things in digital format. If your organisation is stuck in the age of analog tape recorders and clunky transcribing gear, the vPedal offers the perfect excuse to upgrade to a digital recorder – which will also make recordings far easier to archive. The key is to avoid a recorder that insists on using a proprietary format. For example, recordings downloaded to a computer from Sony’s Hi-MD Mini Disc would originally only playback in Sony’s clunky SonicStage software. After frustrated users wrote conversion tools to get around this, Sony finally conceded and released an official WAV conversion tool. With your digital recording at hand, the vPedal is compatible with most transcription software such as Express Dictate, iScribe, Dictation Buddy and FTR PlayerGold. 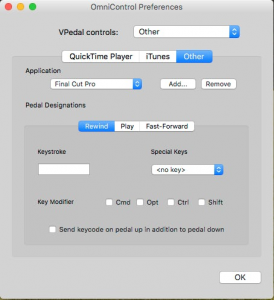 The vPedal website also offers free plug-ins for other software including Windows Media Player, WinAmp, Real Player and iTunes – as well as Quicktime and iTunes for Mac OSX. An API is available so you can customise it to your own needs. The vPedal combined with Express Scribe offers the flexibility and advanced features that serious transcribers look for. These include variable playback speeds, a Tone Low Frequency Cut Filter and compatibility with speech recognition software such as Dragon Naturally Speaking. The automatic backstop feature rewinds up to 5000 ms when you resume playback – a critical feature, according to our Lifelong Research Assistant, who is a seasoned transcriber. It takes some practice before you stop hitting rewind or fast forward by mistake but this comes with time and is an art well worth learning. You will also want to ensure you’re sitting in an ergonomically correct fashion so you don’t strain your lower back with all that footwork. If your time is valuable, or you’re paying someone else to transcribe, the vPedal is a great time-saver that could pay for itself very quickly. My name is Ann L and I just wanted to introduce myself and say, Thank You”. Probably about 1 year ago, I purchased a vPedal. 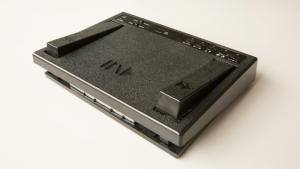 It happened to be the vP-1 foot pedal. I knew nothing about it other than it fit my budget when I purchased it. I could not have made a better unresearched purchase ever. I since discovered the vPedal website and the plethora of free apps and plugins that have absolutely saved my bacon in terms of being able to use and control the functions of this pedal. No company has a more versatile phenomenal pedal than you folks. I work very hard, but do not have a high income, therefore, my purchase budget is always very limited. However, you folks have enabled me to have a device that outranks every other one out there on the market. Your support and availability of all sorts of apps and plugins (as I already mentioned) are second to none. You are VERY unique and I hope you survive for a billion years. I’m actually using it right now! (Well, not right now, right now…right now, I’m writing to you.) But it’s amazing the wide variety of programs with which it’s compatible. I’ve had success not only with Windows Media Player and RealPlayer (with which your page said it would be compatible), but also with Nero ShowTime, the VLC Open Source Media Player, and several others I’ve tested. Although it is not THE ultimate solution for what I need it to do (as mentioned, I translate scripts from the Japanese and rewrite them in English, requiring me to view the same snippets over and over and over to get the “flaps” or mouth movements matched exactly to dialogue), I’m positive that it’s the next best thing. I can’t tell you how grateful I am for all your assistance. Because it arrived a few days ago, I was able to use it for a TV script I had due, and after this I’ll go back to retranslating subtitles for another series. (You have to listen to the same segment over and over to get the proper translation.) With the vPedal hooked up, I can run a full-screen video on a “mirrored” monitor off my Vaio laptop. It’s like I have a professional editing suite…and I can’t tell you how cool that is. So, thank you, for this incredibly useful, stupidly timesaving, and wonderfully versatile gadget. I just received a vPedal and am absolutely thrilled! I want to thank you for this awesome piece of equipment. I am a transcriptionist, and I transcribe material that is used for production of several television broadcasts. I was using an analog transcriber that recorded only the audio on audio cassette tapes. This worked fine, but since my transcripts are used for television production, it would be much more efficient and accurate to transcribe directly from video. The vPedal makes this possible, and it is so much better to transcribe directly from the video. I record the material I need to transcribe using the Windows Media Recorder, and then replay it through the vPedal launcher. It has made my job so much easier and much more accurate, because if there is a problem understanding the audio, I can use the vPedal to rewind and look at the video, which 99.9% of the time clarifies what’s been said. The vPedal works just the same as a transcribing machine that transcriptionists use, but has the added benefit of being able to see the video I’m transcribing. This is an excellent benefit for transcriptionists who work with television or movie production. It is also excellent for transcriptionists who transcribe from audio, since you can use it through, for example, Express Scribe, and you don’t have to store a lot of audio tapes and have a transcriber on your desk. I can’t thank you enough for the vPedal. I’ve been praying that someone would invent a way to transcribe directly from video, and God answered my prayer through the vPedal. I thank God for you. Keep up the good work, and God bless you! 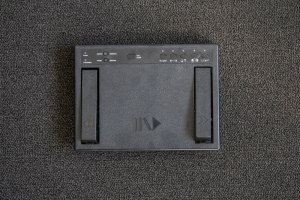 I just received the footpedal and used it with the Real One plug in for video transcription. I’ve been looking for a replacement for the system as I’ve been having so many problems with it that it’s become unreliable. I also use it with Express Scribe which is great because there are greater options for different file formats which other systems don’t contain. I have a small transcription company and I am now recommending it to others… such as subcontractors looking for work but do not have a digital transcription system yet and with another company I’ve subcontracted with for several years to pass on to their other subcontractors. I’m loving it. I teach phonetics and for my Spanish majors who need to improve their pronunciation, I have them record digital files and I correct them. The vPedal has made it so much easier. My wife has been complaining about her foot pedal, which she uses to control the “DSS player” software. (“It’s not as responsive as my old analog foot pedal and tape player; the fast forward and rewind pedals are too close” were her major complaints.) So, I brought the vPedal home from school to see if it would work with the “DSS player.” As I suspected, it wouldn’t. So I converted the files to AIFF format so that Quicktime would play them and I went to “vPedal.com” to download the software to her computer and I jumped with delight when I saw the variable speed in the preferences. “This could be perfect for you,” I exclaimed. It is working like a charm. She loves it. It is responsive, the fast forward and pause and rewind work beautifully; the speed increase is perfect–at least for the doctor she’s been working on for the past few hours. She is delighted, and so am I. Knowing that I had requested this feature, and when we saw on your website: varispeed for transcriptionists, she said, “you’d better write to thank them.” Thank you so much. Thank you – vPedal is exactly what I was hoping for!